I have listed a new property at 1124 DANSEY AVE in Coquitlam. Don’t Miss the Virtual Tour http://www.imagemaker360.com/128813 !! 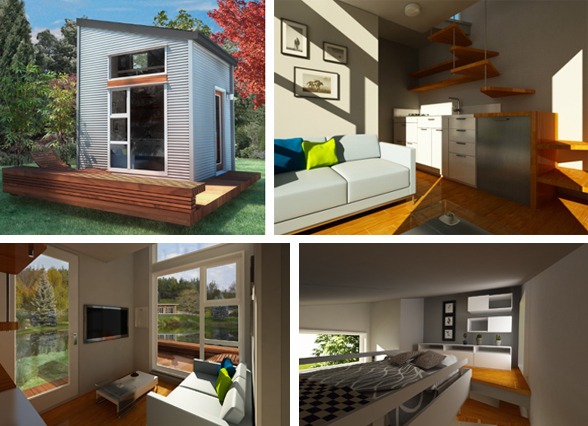 We’re digging the Tiny House concept of NOMAD, a 10’ x 10’ micro house with a 60’ loft space developed right here in Vancouver. It’s easy to assemble and flat packed so it can be shipped worldwide. They cost between $25,000 and $28,000, depending on how well you want it to be kitted out. You can also get “green” off-grid models (ie. solar-equipped), but those are custom-priced. I have sold a property at 994 Howie AVE in Coquitlam. CONGRATULATIONS CRAIG On your winning bid for this Home! We are so happy that we could find you the home you wanted in Coquitlam! Court Ordered Sale. Excellent opportunity to own this 3 bdrn starter home in a great quiet complex in Blue Mountain area, one block from Blue Moutain park, a short walk to Como Lake, Centennial Recreation Center, Austin Heights shopping & transit loop. 5 year renovations include new kitchen cabinets & counters including desk & pantry. Real hardwood floors & crown mouldings. South facing backyard. New roof in 2012. New exterior paint. Needs TLC. CONGRATULATIONS SYD AND NATASHA ON YOUR NEW HOME !! We are so excited for you guys ! It took us 1 year and 60+ homes but we finally found the perfect fit! Congratulations again. This updated family home sits at the foot of Burke Mountain. With a fenced front yard complete with kids playground, beautiful bamboo floors, updated bathrooms, newer roof, a huge covered deck, a 2 bedroom suite [currently rented for $1,000/mo], and lane access. This home is in great condition and ready for you to move in. Close to David Connector; Tranquil Trails; Transit; Shopping; Recreation and Schools. Call today for your appointment to view! A rally in British Columbia’s housing market is expected to extend through 2014 as the provincial economy gathers steam. Sales on the Multiple Listing Service are on pace to reach 71,700 units in 2013, up 6 per cent from last year’s sluggish showing, says the B.C. Real Estate Association. With consumers concerned about the prospect of higher interest rates over the next year, many British Columbians are locking in mortgage preapprovals and shopping for homes, said Cameron Muir, the association’s chief economist. PRICE JUST REDUCED BY TEN THOUSAND DOLLARS !! CORA TOWERS - Court Ordered Sale! JUST REDUCED BY $10,000.00 !! "As Is Where Is". This 2 bedroom, 2 bathroom + Den home features an open floor plan with granite countertops, stainless steel appliances, stunning floor to ceiling windows, HUGE Patio and underground secured parking. Do not miss out on this opportunity!! Exceptional Location on the Coquitlam / Burnaby border!! Walking distance to the Skytrain, bus loop, pub, restaurant, and Lougheed Mall. 10 mins away from SFU & Vancouver Golf and Country Club. Call Today for your private showing! This won't last long! Google Streetview images of the condominium complex at 15220 Guildford Drive, Surrey, in which is located a unit belonging to Rose Jordison that was the subject of a B.C. Supreme Court ruling posted Friday, Jan. 13, 2012, ordering Jordison to sell her unit and move out because of her behaviour and that of her son toward other tenants in the building and defiance of the strata council. Jorsison has moved out, but has appealed the decision. A decision was reserved Thursday in the B.C. Court of Appeal about a potentially precedent-setting case of a Surrey strata trying to force a problematic owner into selling their unit.